Mitt Romney’s campaign should be careful not to make the same mistakes Al Gore’s campaign made in 2000. Will the Romney campaign let Mitt Romney be himself in Tampa? 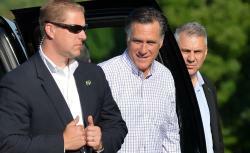 Will the Romney campaign let Mitt be Mitt? I’m actually sitting across from Dave as I type this, so my first visit to a Slate Breakfast Table is actually taking the form of lunch at a downtown Tampa sandwich-and-salad shop run by a social-service ministry. That summer Republicans accused Al Gore of running a “reinvention convention.” We remember the nominee’s adoption of the Shrummian people-vs.-the-powerful shtick, but the more interesting reinvention may have been the one that Gore didn’t have the confidence to stick with. If you recall, Gore asked Spike Jonze to do his version of a Man From Hope film; we were informed at the time that Being John Malkovich was Gore’s favorite new movie. The movie Jonze made depicted the nerdy deadpan Gore many of us never met until David Remnick’s 2004 profile. I don’t know if the full story of the Gore-Jonze interaction was ever told, but it always seemed to offer the decoder ring for those who wondered why Gore’s campaign was unable to take this smart, well-humored, and interesting guy and introduce him on those terms to the American people. After all, Gore was the guy who decided that—instead of a Harry Thomason or Mark McKinnon—he wanted Spike Jonze to tell his story. In my imagined version of that campaign, I can see Gore’s advisers watching the Jonze film and quashing it because its subject just came off as so dorky. We’ll see what the Romney reinvention looks like, but I suspect I may come away from this week with the same feeling I had as I left Los Angeles 12 years ago. Do Romney’s advisers truly know or like their candidate enough as a person to let him be himself in front of the whole country?